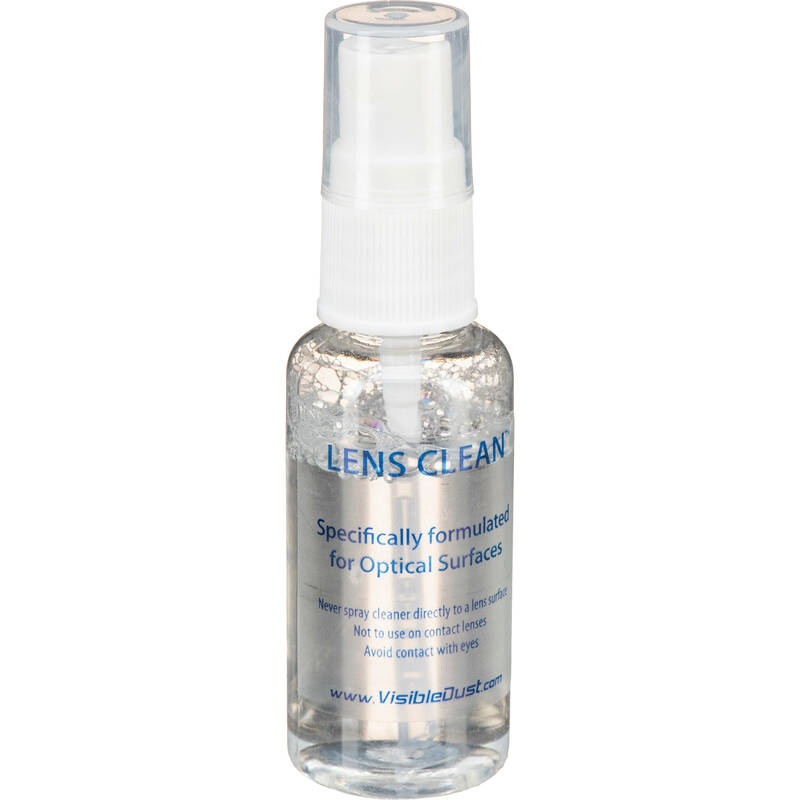 Lens Clean TM by Visible Dust is specifically formulated to safely remove finger prints and water/oil based contamination from optical surfaces without streaking. Most lens cleaning solutions are alcohol based and alcohol by itself is not suitable to remove stains/spots. These kinds of cleaners always leave streaks behind. Use Lens Clean with a Visible Dust Ultra-Fine Microfiber Cleaning Cloth or soft lint-free cloth to effectively clean lenses and optics surfaces. Box Dimensions (LxWxH) 4.0 x 1.25 x 1.2"
Lens Clean Solution (30 ml) is rated 4.5 out of 5 by 18. Rated 5 out of 5 by Michael from Visible Lens Clean Solution With the changes in available products and TSA regs, it's hard to find a good solution. This fits the bill for me. Follow the directions (apply to a micro-fiber cloth and then to the lens, use a dry potion to polish) and it works perfectly. Took off smudges and water spots with a single application and left no streaks or residue of any sort. It's a bit too pricey but that is the only drawback. It works and travels well, that is all I care about. Rated 5 out of 5 by Melvin from Works Well for Sensors, Too! I used this to clean a Canon EOS 5D MKii sensor and it worked quite well. There was a lot of protein and dust on the sensor, but this cleaned most of it. I used a VisibleDust swab and sprayed the cleaner on the end of the swab, then swept it across the sensor, using both sides of the swab. I dried the sensor with a dry VisibleDust swab immediately after using the wet swab. I don't know if this cleaning fluid is recommended by VisibleDust for cleaning sensors, so use at your own peril. All I can say is that it worked for me and cleared most (90+)% of the spots off my sensor. If the sensor dissolves after a few weeks, I will come back and write a follow up to this review. Rated 5 out of 5 by jherrel from Great Product A couple of drops on a microfiber cloth and lens cleaning is easy to use, cleans very effectively and evaporates without leaving any film. With the Invisible Dust MAGIC CLEANER - MICROFIBER CLOTH this is the best lens cleaning fluid I have ever experienced. I have used tissues and standard lens cleaning fluid in the past and this is much better. Rated 5 out of 5 by Ty Bookman from Great Product This is an excellent product, I like the 30 ml container no trouble getting airport screening. Cleans without streaking, I use this product for my camera lenses as well as my eyeglasses. I can't think of any short comings concerning this product. Rated 4 out of 5 by PhotoGraf from Easy to use/travel with Would have preferred a non-spray. Otherwise, a great product. Rated 5 out of 5 by Sandipan from Excellent cleaning solution for lenses Non alcholic base .... cleans the mudges in seconds ... no chance of scratching your the front element of your expensive lens. ... Doesn't dries up immediately like most of the alchol based solutions ... gives time to wipe it. I am very happy with this purchase. Very thoughtful and intelligent make. Rated 5 out of 5 by marida from Lens Cleaner The professional lens cleaner worked a lot better than the home remedies I tried. The cleaner along with a special cloth did an excellent job cleaning the contact points on my lens. I would definitely recommend the product. Rated 5 out of 5 by Anonymous from This solution is incredible I used Lens Clean for my microscope. There was oil dirt and dust buildup present. It took both off, doesn't smell like petroleum products, and leaves no residue. Check out their website for more incredible information. Why it's in-store pickup only now? Previously it was available for shipping. Especially counting it's alcohol free.